The Peoples Democratic Party, PDP, on Monday commenced the screening of its presidential aspirants ahead of its primary. The screening was chaired by former Vice President Namadi Sambo at the party’s Presidential Campaign Office, Legacy House, Maitama, Abuja. The aspirants were: former Vice President Atiku Abubakar, Senate President Bukola Saraki, immediate past Senate President David Mark, former Sokoto State governor, Attahiru Bafarawa and former Minister of Special Duties and Inter-Governmental Affairs, Tanimu Turaki. Also, Sokoto State Governor, Aminu Tambuwal; former Plateau governor, Jonah Jang; former chairman of the National Caretaker Committee, Ahmed Makarfi, and former lawmaker, Datti Baba-Ahmed were also on ground. Some aspirants, who with the News Agency of Nigeria, NAN, shortly after the screening, expressed satisfaction with the exercise. Jonah Jang told newsmen that the process was transparent and credible, and expressed optimism of picking the party’s ticket after the primaries. “The process was beautiful. Absolutely, I stand a chance to win the ticket. I am optimistic because I believe in God and I believe that God is going to give it to me. “We are not going to be distracted. The focus before us is that we should ensure that PDP gets back into office on May 29, 2019”. Atiku Abubakar on his part also expressed satisfaction with the exercise, while Tambuwal stated that the exercise was conducted smoothly without any issue that called for concern. 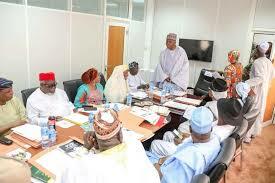 He further used the opportunity to call on INEC to declare PDP as winner of the Osun State governorship election.